Make a fun and magical leprechaun trap from a recycled cereal box! Close the open end of the cereal box using tape. Cut the front (or back) of the cereal box off. Cover the box with green construction paper. Using the piece of cardboard you just removed from the cereal box, cover a section with glue stick. Sprinkle the glue with glitter and let it sit for about 5 minutes. Tape the excess off onto a piece of paper and funnel the excess glitter back into the glitter container. Cut the glittered cardboard into squares. Use scissors to round the corners of the squares to make gold coins. Set the coins aside. Cut red, orange, yellow, green, blue and purple construction paper into 2-inch wide strips. Begin with red, glue the orange strip on top of the red overlapping by 1-inch. Next add yellow, overlapping the orange by 1-inch. Continue this process with green, blue and purple. Trim 1-inch off the last (purple) strip so that all visible colors are 1-inch wide. This is your rainbow path. Cover a piece of white construction paper with white craft glue. Add cotton balls to the craft glue to create the clouds. To connect the rainbow path to the cloud, run a bit of glue stick along the underside edge of the path and stick it to the white paper, just under the cotton balls. 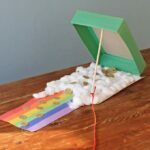 Pile some of the gold coins onto the cloud, then create a “bread crumb” type trail of coins from the cloud down the rainbow path. Get your kids to set up the trap by placing the clouds and path on the table or floor. Tie yarn around one end of the dowel. Prop the cereal box up with the dowel and hide! When the leprechaun follows the gold trail and ends up inside the box with the pile of gold, pull the yarn which will yank out the dowel and drop the box, trapping the leprechaun inside! Be sure to remind your kids that they are very, VERY fast. So fast, they may not even see him escape! This project for Cereal Box Leprechaun Trap was printed from CraftsbyAmanda.com - https://craftsbyamanda.com/cereal-box-leprechaun-trap/ and can only be printed for education or personal use.